Whether they live down the street or across the country from their grandchildren, it’s clear that Jewish South Palm Beach County is full of active grandparents. Knowing that many cherish their role of l’dor v’dor (from generation to generation), PJ Library® in South Palm Beach County offers opportunities to pass the values and traditions so dear to them on to the younger generation. Now, in addition to offering PJ activities all around town throughout the year, the program is reaching out in a new way. To kick off their initiative, PJ is hosting their Grandparents & Special Friends Celebration on Wednesday, May 2, 2018. All Grandparents and Special Friends are invited to delve into and celebrate their important Jewish grandparenting role over breakfast (dietary laws observed) at 10:00 am at the Jewish Federation of South Palm Beach County’s west Boca campus at 9901 Donna Klein Boulevard. Special guest speaker, Dr. Leon Weissberg, will discuss “The Etymology of L’Dor V’Dor - from Generation to Generation.” Not only is Weissberg a Professor of Jewish History and longtime Jewish educator to all ages, he’s also a PJ Library grandparent himself. The breakfast coincides with the fifth birthday of PJ Library in South Palm Beach County. 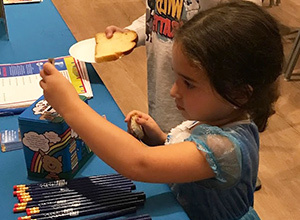 More than 1,900 local families raising Jewish children in South Palm Beach County are now receiving free, high quality Jewish books, bringing Jewish life right into their homes. 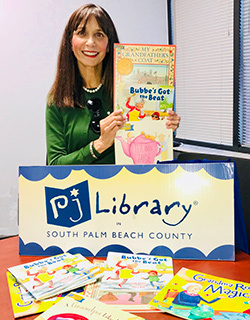 An additional 375+ South Palm Beach County children ages 9-11 receive books from PJ Our Way™, the next chapter of PJ Library. The couvert for the Grandparents & Special Friends Breakfast is $36 per person. RSVP is available online at jewishboca.org/pjgrand or through Elana Ostroff, PJ Library Director, at 561.852.6080 or email pjlibrary@bocafed.org. The PJ Library South Palm Beach County Partnership is made possible by generous support from the Jewish Federation of South Palm Beach County, United Synagogue of Conservative Judaism, Union for Reform Judaism, Leon and Toby Cooperman Family Foundation and the Harold Grinspoon Foundation, as well as generous local donors. The PJ Our Way program is a gift from the Harold Grinspoon Foundation and PJ Alliance Partners, with support from the Jewish Federation of South Palm Beach County.